When I was at a food exhibition in HK lately, I saw some sales of Hokkaido milk. Knowing that the milk from Japan would definitely taste good, and that my children will definitely love it, I lugged back 4 one litre tetra paks. 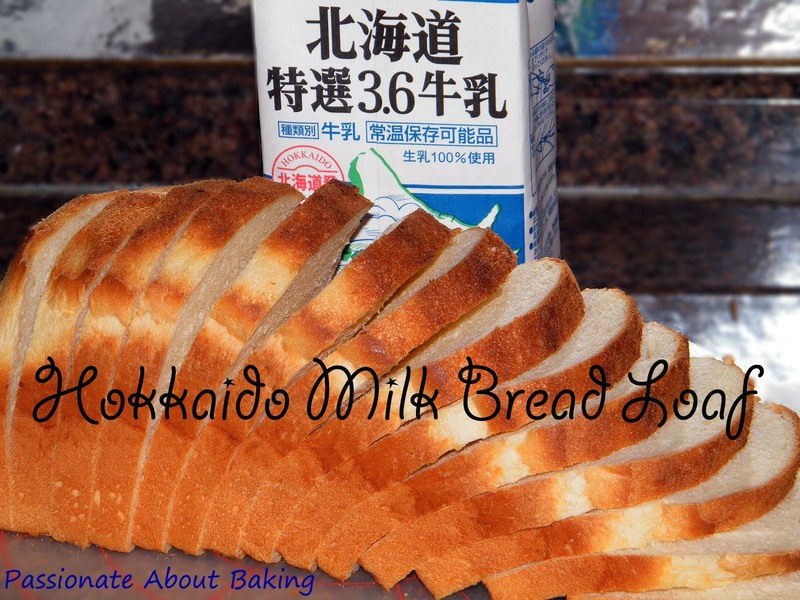 I also recalled that I have seen many bloggers baking "Hokkaido Milk bread". 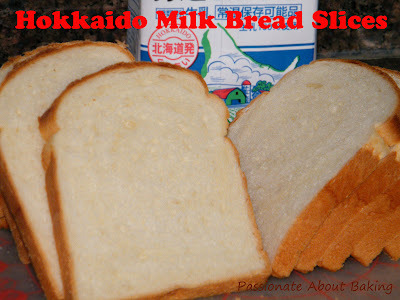 So without hesitation, I searched for the recipe from Florence blog, and found a recipe on Hokkaido Milk loaf. Wanting to know how the milk taste, I had a quarter cup of the milk. It just perks me up! No wonder it's so popular. The milk taste is creamy, thick and tastes very rich. My children also loved the milk very much. Therefore, I had to ration them to one cup per person per day! Otherwise, the three of them can definitely finish four litres in two days! They'll treat it as water to drink! I tweaked the recipe a bit. When the dough was undergoing its first floor time, it didn't rise much after two hours. I thought it flopped. I proceeded anyway. After the third proofing, it only rise to half the pan loaf. Gee, something must have gone wrong with my recipe. I thought I wouldn't share it if it doesn't turn out well. So I proceeded to bake it anyway. I was very pleased that after baking, the bread rose till the rim of the bread pan. It rose to twice its size under the heat. I concluded that the bread needs to be stressed before it could "perform". :p I was also very pleased with my galvanised bread loaf pan. I had this bread loaf pan for a long time and I always use it whenever I bake loaf bread. Initially, I regretted spending >$20 for the loaf pan with cover. However, when I started using this loaf pan, I had no regrets. No matter what was inside the loaf pan, the loaf bread will come out nicely when it's being over-turned. No brushing of shortening, oil or flour is required. If you do not have one, I would strongly recommend you to get one if you bake bread loaf often. The bread is soft and fluffy. The following day, it is still soft and nice. I must qualify that this is not those cotton soft bread that we have. The milk taste is very distinct and you can just eat it on its own. Even my helper commented that the bread is very nice. I was so glad I gave this a try. I might do this pretty soon again, before my children finished up the milk! Recipe for Hokkaido Milk Loaf, extracted from Florence's blog. 1. Put all the dry ingredients into the mixer and mix well. 2. Add in the liquid ingredients except butter and mix well. 3. Add in butter and knead until smooth and elastic and the dough no more sticking at the side of the mixing bowl. 4. Let it proof for 60 minutes in a clean bowl cover with cling wrap. 5. Flatten the dough and roll it up like swiss roll. 6. Placed it into a loaf pan and proof for another 50minutes. 7. Brush some milk on the surface of the bread dough. 8. Bake at 170C for 30 minutes for uncovered loaf tin. Jane, the bread looks very good. Are these refrigerated tetra packs or just room temperature tetra packs? Wah Jane, your loaf sure looks better then store bought ones! 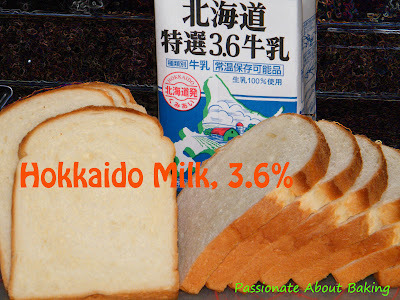 I was once quite tempted to buy the Hokkaido milk once, but gave up the ides when I see how $$$ it cost, lol! *stingy me* Okay, since you made such nice bread with it, I'm sold!! Your loaf looks very very good, being a bread lover I am falling in love with it now. hahaha. Btw can you share how to get even slices like urs? Wah! Goes well with homemade kaya! I have seen some supermarkets in hk put at the chiller area and some at the room temp. When I saw it can be kept in room temp, I also quickly grab a pack back. I find it nothing special so when I went hk the next time I also didnt buy again. First of all, your bread slicing skill is marvellous. I tried this recipe before. Despite not using Hokkaido milk, it is still good. I can't imagine using the real stuff, I think it is even better. Thanks! I'm a total bread fanatic too! For this loaf, I used a serrated knife I bought from Daiso. Cheap and good. When slicing the bread, place your left hand on top of the loaf, with your index finger as the indicator on the thickness of the loaf, then using your right hand with a serrated knife, gently sliced down the bread using sawing method next to your left index finger. Errm...I hope it's not too complicated? Hope this helps. I've not seen it in the chiller area though. If not, I definitely won't buy it. I guess it's just different taste buds for different people. I've bought all kinds of UHT milk for my children, ranging from Magnolia to Marigold to Cowhead to Meadow Fresh to Emborg. They will be my taster and tell me what is nice, and what is not. They simply love this Hokkaido milk. I drank it and I personally like it too! Thanks! This loaf is exceptionally nicely sliced. Oh, you've tried this too? Don't you think it's really nice? Wondered if I could substitute the milk with chocolate milk. :p Ah, you must ask your spouse to buy for you if he can get hold of this. It's a must try! Jane, the bread looks so so good, better than store bought. And the slicing is so perfect like slice from machine, impressive! The bread looks really yummy, like those from the olden days type of bakery haha! Thick and soft slices. WOW Jane! Your Hokkaido Bread looks really super good! I must be very tasty one! Beside, the bread was nicely sliced. How did you do that? Very evenly sliced! Thanks. I was happy that I can managed to slice them nicely. Edith said she has tried it using ordinary milk and it was good. Perhaps you can try it too? 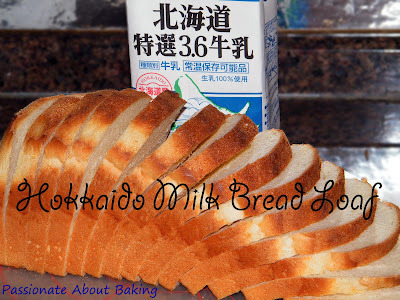 Wow, baking a Hokkaido milk loaf with real Hokkaido milk! It must taste really good! You are so smart to lug the 4 litres back. Just wondering can we get this milk in Singapore? Thanks. Time to bake and eat more breads? Oh, this certainly looks really really good. You are very "hard-working" to lugged these milk back! Must give it a try if i go HK. Any idea whether is it available in s'pore supermarket? Ya lor, very "gu luck". It's not selling in Sgp leh, otherwise I won't have bothered to bring them back all the way from there! Jane, this milk is found at Meidi-ya supermarket(Liang Court)..! I heard its $9.80 per pack (1 litre). I guess its not expensive considering the fact that you have to lug it back from Hong Kong to sG. Jane, the milk tastes better due to the way the cows are bred and the grass they are fed on. :) I came to understand all these while working for Food and Travel magazine and went for food tasting. Beef from cows that ate grass with morning dew tastes very much different from those who ate grass on the plains..! or dried hay which the farmers fed them. That is why there is so much talk in the West about "Free Range" livestock. Pardon my ignorance...I am starting to pick up baking and love yr bread it looks...but in yr receipe, it says 3g yeast, how does it measure in terms of tsp? I measured it in terms of weight. I believe 1 tsp is about 5g. So you might want to base on that to estimate? Hope this helps. At Takashimaya Singapore, B2 Food Hall @ Kyoho-Ya Boutique Shop, you can get it now at S$6.90! It has just arrrived last week. Thanks for the info Min. I hope it's permanently selling there. I'll go and grab a packet if I'm there!